When you have a tall kid, you make them play basketball. It’s an unspoken parenting rule that Paul Rowley’s ’17, J.D. ’20 parents did not ignore. Already 5?8? at 11 years old, Rowley was thrown into the world of basketball and has been playing ever since. Rowley took his love of basketball with him to William & Mary. For the fourth year in a row, Rowley is playing on the Tribe men’s basketball team as a forward. Rowley graduated in three years from William & Mary with a double major in computer science and finance, and is currently in his first year at William & Mary Law School. 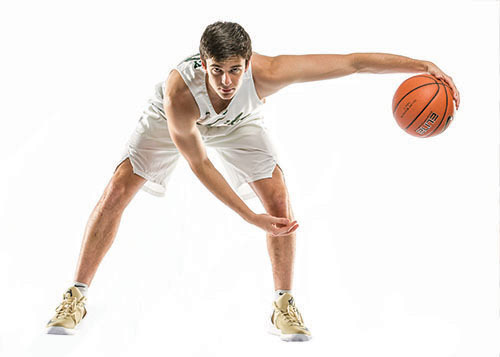 Rowley is the only known William & Mary basketball player to take on the challenge of balancing hours of law school classes and studying as well as being a key player on the basketball team. Rowley started his career at William & Mary in 2014 as a redshirt freshman. Rowley played alongside some of the greatest William & Mary basketball players. Marcus Thornton ’15, Terry Tarpey ’16, Daniel Dixon ’17 and Omar Prewitt ’17 all served as not only teammates to Rowley, but as mentors. His motivation came not just from his teammates, but the scholarship he received to attend William & Mary. While it would be easy to take such an amazing opportunity for granted, Rowley constantly reminds himself how lucky he is. “I probably have the coolest job I’ll ever have,” Rowley says. “Effectively, I have one full-time job to be a student, and I have another full-time job to throw a ball in the hoop with a bunch of guys whose company I love and enjoy. I try and love every day. I have a great opportunity, somebody is subsidizing my whole life and I am so grateful for that. While Rowley is receiving scholarship support at William & Mary, he doesn’t forget to give back because he was given the opportunity to play Tribe basketball. Rowley donates annually to the Ten for the Tribe program, which was created to emphasize the importance and impact of private support to athletics programs among student-athletes. “We support Ten for the Tribe so we can all recognize and show appreciation to those who support our programs since we don’t get funding from the state,” Rowley says. Being a student-athlete, Rowley had to mature quickly and learn to balance basketball and his academic studies from the start of his college experience. Balancing a full class load as well as his basketball schedule took time to perfect. As with any college student, particularly a law student, sometimes the stress of school weighs on Rowley. He constantly holds himself to the highest standard, but even when he falls short, he knows how to pick himself up again. Despite the pressures on his time, Rowley has not only endured, but thrived. Not only did he graduate in three years, he was inducted into Phi Beta Kappa, becoming the first basketball player to receive this honor since Wayne Metcalf (Class of 1913) in 1912. On the court, he has steadily grown in his role and is a valuable contributor in the team’s front-court rotation. Despite this steady improvement and passion for the game, when Rowley thinks about his future, basketball doesn’t seem to be in his plans. In fact, he’s ready to dive head first into a career in law. With two years left to play, Rowley has already made Tribe basketball history for playing on the team while being in law school. Once his basketball career winds down, he will take his hard work on the court into the courtroom.